Exceptional, Spacious Home with Sea Views! Bedrooms: 3 "Three Large Suites"
Bathrooms: 3 "All Ensuite, One w/Jetted tub"
Garage: 5-Stalls, Attached "2 Double Car, 1 Boat"
Magnificent home in La Hacienda particularly designed for extended family gatherings, offering unequalled views of The Sea of Cortez, the bay of San Felipe, and the San Pedro Martir mountain range! Situated on two lots with easy beach access this is one of San Felipe's most unique homes. Enter through the arched pedestrian Hacienda-style entrance or the attractive wrought iron gate into a front yard with colorful landscaping and stamped concrete driveway. Custom glass doors invite you into the home where a short flight of stairs leads you to the guest quarters on the middle level or up to the Main Living Space with Rotunda accent. The living room, dining and open kitchen flow into one another with natural sunlight streaming through the generous windows and sliding glass doors. The comfortable living space affords a lovely propane fireplace, social library and reading nook. The open kitchen is designed have the chefs be part of the party, while guests can relax in the living area or at the glass topped dining table with swivel chairs. However don't be surprised to find everyone outside on the tiled deck: this is where the BBQ, a 6-seater outdoor dining table, trellis, and cafe table are located, including a chiminea for the cooler evenings. On this deck you have the option of ascending to the roof top with swing chair to absorb the panoramic views or descend to the Middle level entertainment patio. Through the arched doorway off of the dining area lies the nicely sized office space, then onto the private Master Apartment. Expansively sized with ample space for a private sitting area, king sized bed set, and private south facing balcony. The Master en suite affords his and her vanities, walk in shower, water closet, plus a walk in organizational closet with custom drawer unit. Friends and Family will be very happy to take advantage of their Middle Level living space, with suites on opposite ends of the conversation area. The suite on the left side provides a built in closet and three piece en suite. The suite to the right hand side is perfect for parents with younger children as a queen bed, bunk set and walk-in closet are offered in this room. Additionally this en suite is conveniently outfitted with a jetted tub/shower combo. Each room provides sliding glass doors to the immense entertainment patio and oversized deck. Equipped with outdoor seating area, lounge chairs, intimate dining table, hot tub, fire pit, and ping pong table, every aspect of comfort has been taken into consideration. Oversized, retractable glass windows allow you enjoy the patio when the winds are prevalent, or invite the sea breeze in while sun shades diffuse the sunlight when necessary, additionally misters are also installed for the warmer temps. The laundry room can be found at this level just off of the conversation area, outfitted with Kenmore Front Load Washer and Dryer combo with easy garage access. The lower street level entrance with wooden entry gate is an ideal location for the quads to escape into the desert for fun adventure and is home to an additional double car garage, boat garage, work shop, and outdoor half bathroom. If you desire, a casita could definitely be added here! One of the most unique properties available in the area...Thoughtfully designed and constructed with every convenience in mind while offering unobstructed Sea of Cortez views, easy beach access, stunning mountain views, it doesn't get any better than this! Sold Furnished and priced at $375,000 with the inclusion of quads, sailboat, pontoon (not pictured), and trailer (not pictured). Showings are by Appointment Only for qualified Buyers...call us to arrange a time to view this exceptional property! Property is held with an Individual Fideicomiso with Banorte Bank. 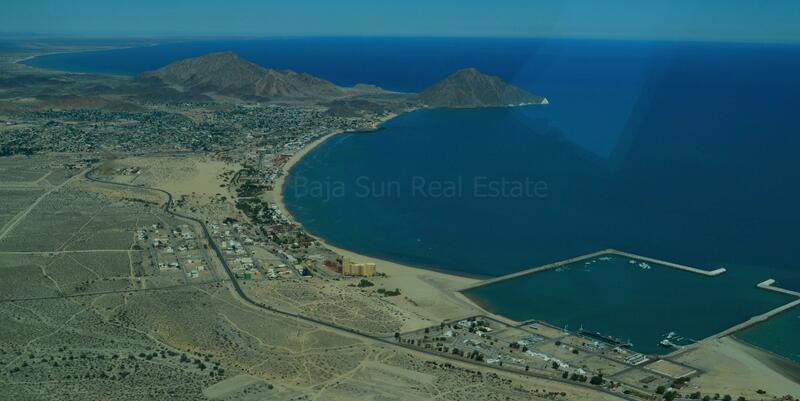 La Hacienda is located a short 10-12 minute drive south from San Felipe town near the San Felipe airport with electricity, private water well, beach access, plus the newly installed, HOA maintained security entrance.